There is something almost magical about loading an infant incubator, which has kept hundreds of newborn babies alive in Canada, on board a ship and knowing it will continue to help children in Chile. I recently had the opportunity to load a 40-foot sea container with medical and dental supplies to be shipped to Iquique, Chile. Members of my Rotary club joined other clubs in Metro Vancouver, British Columbia, in filling the container with 30 hospital beds, nine manual and two electric wheelchairs, a full dental office with instruments and chair, an infant incubator, two ultrasound machines, and numerous boxes of medical supplies and equipment. Hospitals, medical centers, senior facilities, and dental offices in Vancouver donated the used equipment and surplus supplies. Rotary volunteers picked up the items, sorted them, and applied bar code labels. The cost of shipping the container was US$8,000. The estimated replacement value of the 16,000 kilograms of aid is in excess of $200,000. Funds for the shipping costs came from several Rotary clubs in Metro Vancouver and a grant from The Rotary Foundation. 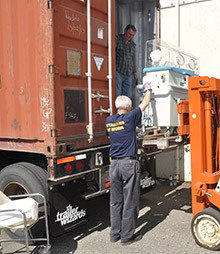 The container was shipped by Rotary World Help, a charity run by local Rotary clubs. This is one of many medical equipment shipping projects Rotary clubs are involved in around the world. Each is exceptional and each changes the lives of the recipients. The opportunity to load the container and have a personal connection makes these projects unique and memorable. This entry was posted in Fighting disease, Saving mothers and children and tagged Canada, Chile, health, medicine by Rotary International. Bookmark the permalink. Folks,we are members of the Rotary clubof Vandeikya Hilltop District 9125 – Nigeria. We would like a similar assistance, if that would be we are a ruralclub and this would really enhance us. This is wonderful and a mark of reaching out to humanity – hence engaging all Actors!! That Container will go a long way to save children lives.